During the early part of the 18th century, John Churchill, 1st Duke of Marlborough, kept red and white King Charles type spaniels for hunting. The duke recorded that they were able to keep up with a trotting horse. His estate was named Blenheim in honour of his victory at the Battle of Blenheim. Because of this influence, the red and white variety of the King Charles Spaniel and thus the Cavalier King Charles Spaniel became known as the Blenheim. 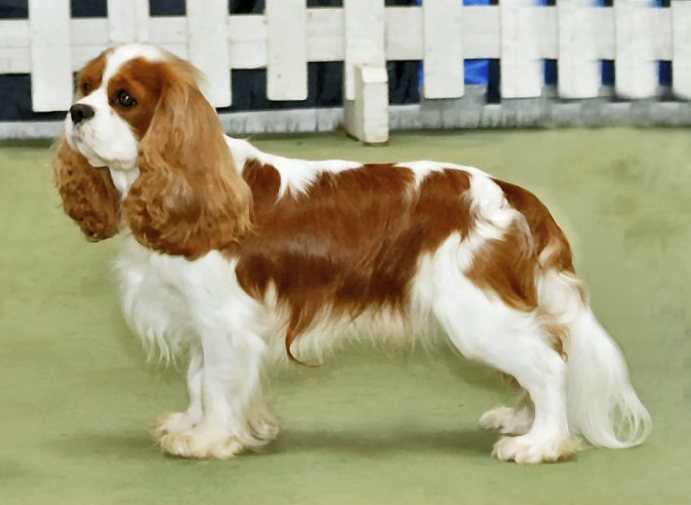 Attempts were made to recreate the original King Charles Spaniel as early as the turn of the 20th century, using the now extinct Toy Trawler Spaniels. These attempts were documented by Judith Blunt-Lytton, 16th Baroness Wentworth, in the book "Toy Dogs and Their Ancestors Including the History And Management of Toy Spaniels, Pekingese, Japanese and Pomeranians" published under the name of the "Hon. Mrs Neville Lytton" in 1911.